Today we take a look at ten of our favourite American characters of the Grand Theft Auto series who are of African descent, many of these characters are not only popular but has given the series many memorable moments which wouldn't have been possible had they been absent from their respective game, but most of all you have to give gratitude to the many black voice actors Rockstar games have hired for the job, who gave life to their characters like Young Maylay, Samuel L. Jackson and Mc Eiht just to name a few. While GTA 3 was one of the first games to introduce a major American American character called 8-Ball whose appearance wasn't seen outside of the loading screen or cover box art, it wasn't until GTA San Andreas that we saw more prevalent African American characters. This was the first game in the series to feature a playable black protagonist much to the dismay of some prejudiced and very vocal fans back in 2004, despite this Rockstar games went ahead with the gangsta themed concept and thus made one of their greatest games to date, and it's no secret that San Andreas was a success due to it's charismatic characters, massive hip hop influence, parody of LA gang culture and black gangster movies of the 90s. 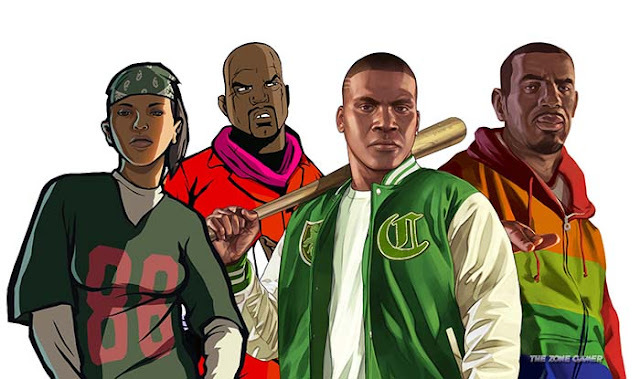 After GTA SA many other games have featured African American characters including GTA IV and most recent GTA V, whilst IV's protagonist isn't black it still featured several AA characters who affected the storyline and V went right back to what made San Andreas such a hit and allowed us to once again play as a young African American man called Franklin, although unlike San Andreas he wasn't solely the main playable protagonist, nor did he have much storyline compared his other counterparts Michael or Trevor. Fast forward to the present day and we're left with an assortment of African American characters who breathe life into the GTA franchise.